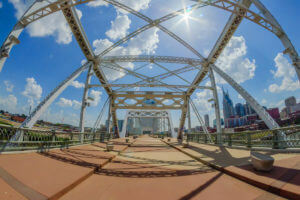 Getting Around Nashville On Vacation - Enjoy an Easy and Fun Vacation! Nashville is chock full of attractions and points of interest and to those who live and work there, it’s an easy city to navigate. But if you’re planning a Nashville vacation, it’s a smart idea to be aware of the various transportation options—if you’re considering renting a car, keep in mind that parking can be difficult and expensive. Here’s a look at the best ways to get around Music City. The Old Town Trolley is the top choice for getting around the city easily and making the most of your vacation time. Traveling on a continuous 12-mile loop and making 15 stops, our Trolley Tour allows you to tour all day, hop on and off whenever you wish and enjoy a historic (and humorous) narrative by our conductor who’s also a local historian. While on board the trolley, you’ll be transported to the most popular attractions and historically important sights in Nashville including the Country Music Hall of Fame, Johnny Cash Museum, Goo Goo Shop, Ryman Auditorium, Lower Broadway, Centennial Park, Vanderbilt University and more. Nashville’s bus system provides service to and from the airport and in and around downtown Nashville. The MTA has busses running throughout the day and day passes are available. In addition, the Music City Circuit offers passengers free transportation in downtown Monday through Saturday, the Green Circuit offers transportation between downtown and The Gulch and the Blue Circuit provides transportation between the Schermerhorn Symphony Center and Bicentennial Mall State Park. Nashville’s commuter rail system has six stations between Lebanon and the destination station at Riverfront Park in downtown. Trains operate Monday through Friday and you can pick up a public bus from each of the stations. There are numerous taxi companies that operate in Nashville and taxi fares are set at a flat rate within the triangle between the airport, downtown and Gaylord Opryland Resort and Convention Center. Also, both Uber and Lyft ride-share services are available in Nashville and a ride can be dispatched within minutes once you’ve downloaded their apps. If you prefer to explore Nashville via bicycle, you’ll have various choices. There are approximately 30 stations in the area and hundreds of bikes available. You can rent a bicycle by the hour or by the day or get a weekly, monthly or yearly membership. Located in downtown Nashville, WeCar offers a car-sharing program to visitors and locals who need a car by the hour, by the day or even overnight. If interested, you must register for membership online ahead of time.